To say Ken Liu’s The Legends of Luke Skywalker has been keenly awaited would be an understatement. Since the great reboot that followed Disney’s acquisition of Lucasfilm, there have been exceedingly few stories of what Luke has been doing after the fall of the Empire. There was Shattered Empire, but that was only one issue out of four and that was more or less it. For some the book has been a disappointment for its lack of actual ‘here’s what Luke really did next’ material. Instead, the book is of a far more playful and trickster nature, built around stories being told of Skywalker. Are they all true? That’s up to the reader, but there are hints that sometimes tip the deck one way or another. Expecting a book coming out ahead of The Last Jedi to have much in the way of revelations is expecting the impossible, the pattern was set by The Force Awakens. If there are major ‘this really happened’ stories, they will be next year, not now. Nor was the book ever deceptive about its premise in its marketing either. The first story concerns an engineer spinning a tall tale to a rapt audience. It is subtly suggested the audience’s main interest is in how ludicrous a tale can be spun, for it is a tale of mad, bad conspiracy theories aimed squarely at the exploits of Luke, Han and Leia, with one aim: to drag them down and dismiss them as frauds. When the reader engages with this tale, the initial response may well be to opt for outraged dismissal: what a pile of crap, this is an outrage. Yet to do so would be to play into the story’s hands, Liu is quite aware outrage might result. Look further: When we read or watch or play a Star Wars story, we do so separately from our lives. Luke, Han and Leia are not actual people. What if they were? If you were living in that galaxy at the time of the films or after, if you heard three people led the war the take down the Empire that ran the galaxy, then how can you possibly live up to that? If they did that with their lives, what does that make yours? Easier, by far, to spin a few conspiracy theories that render them frauds as then you’re protected, no comparison to lose out to. The story also throws a curveball in terms of one of its audience members. It is both restrained but quite clear that it is Luke who is egging Redy on in her tale. It might be asked why he does this. Luke’s answer is quite, quite excellent and highlights a key question: what was the Rebellion for? It was not to set up Luke, Leia and Han as mythical figures to be worshipped, it was not to govern whatever idiot theories people might like to spin a pub, it was not to control people but the exact opposite. Redy is free to spin her theories without consequence of being jailed or tortured or executed and Luke does not need her adulation. That is what the Rebellion was for. How then is Luke such a threat to the First Order? Well, if nothing else, the First Order is all about control, control of the galaxy, control of people, all for the greater good, of the First Order. Still, there’s an easy enough solution to the Skywalker problem – find the planet he is on, dispatch a couple of Star Destroyers, they turn the planet to sterile, smoking glass and that’s that. Except it won’t be. 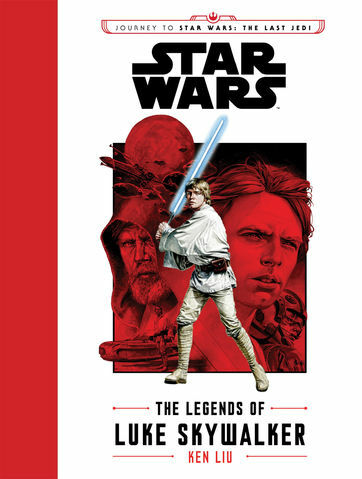 One of the themes running through the book is that Luke has become a figure of myth in terms of stories. He has gone places, done things and stories are spun about those, which in turn has rendered Luke immortal, even if the First Order did succeed in killing him, still Luke would live on. So what of it? So what if he’s a figure of myth? That is of little threat to an organization in possession of planet-killing super-weaponry. Well, it would be except what happens if they engage Skywalker? What then? He might kill his attackers, but far worse is that he could convert them. Ah, you mean brainwash them with some Jedi coercion? That would be very much the First Order’s preferred option, but no, Skywalker’s method would be far, far more dangerous, as the second story demonstrates. Here, it is told by a former Imperial, who was saved on Jakku by a mysterious stranger who was very knowledgeable about how to live in a desert. Only at the end does the Imperial realize that his mysterious benefactor was truly so, in stark contrast to the official, Imperial portrait of him. Nor is it ever said it was Luke, but if not him, then who? That experience changed the Imperial’s life substantially for the better, but from the First Order perspective it shattered their entire carefully maintained and controlled perception of the galaxy. The third story concerns Luke investigating a new way of understanding the Force, which gives the biggest potential hints as to what he might be up to in The Last Jedi, though it is hard to say for certain ahead of the film. Sequel trilogies tend to be aimed at a more subtle, sustained form of evil than the original. So, in the first trilogy it is all about simply defeating the Empire, albeit with the spiritual battle of the lure of the dark side, which both Vader and the Emperor deem superior. For the sequel trilogy, it would seem Luke’s ambition is about more than simply defeating the First Order (equally, it may be he has absolute faith in Leia’s ability to defeat them, for they already took down an Empire). It may well be that Luke isn’t satisfied with defeating the latest iteration of a dark side evil, but is looking to break the cycle entirely. It may also be that that endeavor is one not accomplished by directly fighting or bringing force to bear. Luke has form for finding ways through impossible situations – see the Battle of Yavin and his duel with Vader on the second Death Star. So, who wants to bet against Skywalker? The fourth tale takes a refreshing angle on the old, well known rescue story by making those to be rescued droids. Droids? Why would Luke care about droids? Why wouldn’t he care about droids? Luke has stuck with R2 for a long time, and has never memory wiped either R2 or 3PO. The idea here is both simple and devastating: Everyone and everything matters. Again, this is an existential missile aimed squarely at the First Order’s rotten philosophical heart and anyone else given to truly being cynical. That the narrator of this one is a droid gives it a unique perspective too. The fifth story is, for me, one squarely aimed at the idea that canonicity is all that matters, because there’s no way this one happened. The story is a retelling of Luke’s taking out of Jabba but from an entirely different perspective, with the teller claiming all the credit for the success of the operation. Skywalker? The kid wouldn’t have tied his shoes up without help! It acts as a neat change of pace after the quite dark and serious story with the enslaved droids. The final story sees a biologist investigate a site on an asteroid with Luke accompanying only for them both to end up in the belly of a whale, a space whale in fact. Yes, the very same type that Han flies the Falcon out of in Empire. In the course of seeking a means to escape while staying alive inside the beast, they find all manner of new life and also ghosts. They find the remnant of three beings swallowed long, long ago. It is in understanding what happened and what is now needed that the means to escape is found. More importantly, for Luke, is an expanded understanding of the nature of sacrifice, which in turn allows him to better see what Obi-Wan was truly up to on the Death Star when he let Vader strike him down. Now, does that mean Luke will die in The Last Jedi? If it is going to happen, I would instead suspect Episode IX. Nor is sacrificing himself for the good of others a road unfamiliar to Luke. He has done it more than once – Yavin, Bespin, Tatooine, Endor – in all of these he was quite willing to die so others could live. About all that can be said about such a move is that it would be on Luke’s terms and it is not something he would see as a defeat. Far from it, like his teachers, he would see it as the zenith of what he was seeking. 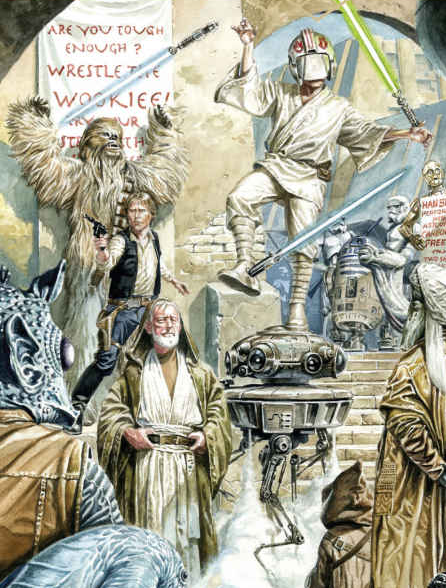 It is the second story that has the line that gives this piece its title “We Are All Luke Skywalker. What is meant by that? For me it comes down to this – every day you get to choose how to live your life. You can be truly optimistic or cynical, you can expect the worst or best of people, you can indeed be a complete piece of crap to everyone who crosses your path, to the delight of Darth Sidious, or you cannot. Are you going to try to make things better while seeing the best of people, or see them as means to an end for the greater good, as decided by you?